Pokarna Ltd - Will Company Deliver Multibagger Returns? We keep on receiving mails to share some of our new stock ideas which can deliver multibagger returns like our past Hidden Gems stocks. As many of you are aware, our Hidden Gems stocks like Camlin Fine Sciences, Wim Plast, TCPL Packaging, Cera Sanitaryware, Kovai Medical are multibaggers which have given returns in the range of 600% to 1700% in period of 2 to 5 years. To keep interest of our paid subscribers, we do not disclose our Hidden Gems or Value Picks stocks released in past which have not achieved their target price. We also do not offer any free trials as our Hidden Gems and Value Picks services are meant for medium to long term investors and are not for traders. Hence, trial of few weeks does not make any sense as you are supposed to invest with time horizon of at least 1 to 2 years and not just for couple of weeks or months. However, as an exception we decided to circulate one of our Hidden Gem stock released last year which is currently available below our initial recommended price and offers a great investment opportunity for long term investors. As our Hidden Gem report was released 6 months back, we decided to make it public for benefit of all our subscribers. Hidden Gem stock of Oct'15 - Pokarna Ltd (BSE Code: 532486) was released on 8th Nov'15 by us and stock has given negative returns of -8% to our Hidden Gems members in last 6 months. Our team suggested Buy on Pokarna Ltd at price of Rs. 1086.25 on 08 Nov'15 with a target price of Rs. 1975. Pokarna stock made its 52 week high of Rs. 1425 on 4th Aug'15, 52 week low of Rs. 660 on 19th Jan'16 and today closed at Rs. 995 giving as on date returns of -8% since our initial recommendation. In Dec quarter, net profit of Pokarna rose 40.8% to Rs. 20.81 crore as against Rs. 14.78 crore during the quarter ended Dec'14. Sales rose 23.94% to Rs. 97.23 crore in Dec'15 as against Rs. 78.45 crore in Dec 2014 on consolidated basis. We believe stock is overlooked by investors fraternity and hence available at attractive valuations considering its consolidated earnings compared to peer group companies. However unlike other companies, high debt on books is a concern in short term and we need to keep a close watch on how management will reduce its debt going forward as company is generating good cash flows from its subsidiary business. Established in 1991, Pokarna Limited is one of the largest exporters of finished granites and engineered stone in India and provides the best quality material to its clients from more than 50 countries (including Granite & Quartz surfaces) globally. Company majorly exports its products to markets like U.S.A, Europe, Russia and Australia to name a few, apart from the domestic market. Initially Pokarna entered the industry with quarrying and thereafter, expanding its operations into manufacturing of slabs, tiles and cut to size for the various requirements in the industry all over the world. Today, company processes more than 80 premium colors both from India and abroad to the most reputed companies though out the globe. The Company’s main sources of supply are its own quarries. It also sources part of its requirement from reputed and well established domestic and global independent suppliers. The Company’s captive quarries are endowed with some of the most coveted and desirable colors like Silver Waves and Cream Kashmir etc. Pokarna also manufactures and sells Engineered Stone or Quartz under the brand “Quantra” Natural Quartz Surfaces from its 100% owned subsidiary M/s. Pokarna Engineered Stone Limited (PESL). PESL is amongst the Country’s leading engineered stone manufacturing Company with exports across most of the developed and emerging markets, with a strong presence in the US and Europe. It is also the nation’s only company to manufacture quartz surfaces using the patented Bretonstone Technology. Bretonstone System from Breton S.p.A. of Italy, is considered to be amongst the finest of its kind in the world. PESL, markets its engineered stone products under the brand Quantra® which is available in 64 different color palettes besides being rich in aesthetic appeal also offer an unbeatable quality and panache. Quantra is produced using over 95% of natural quartz. The anti-scratch, anti-stain and anti-bacterial properties make an ideal choice for all kitchen countertop, flooring and cladding applications. The Company’s manufacturing unit located at Vishakapatnam is equipped with extensive laboratory, enabling the company’s R&D staff to develop new colors, besides facilitating conducting of tests and analysis of various products viaits modern machinery. Further, being situated in the port city, offers several advantages to the Company as it allows the factory to utilize quartz from the state of Andhra Pradesh, which is noted for its strong physical characteristics and high level of clarity. Company also operates its Apparel Division. Located in A.P, company unit is a one of its kind, state of the art manufacturing facility. Retail chain of Stanza as a brand in Men’s wear was launched in the year 2004 with a vision to become a premium lifestyle brand for men. In last financial year, the Granite Division garnered revenues worth Rs. 183 crore as against Rs. 155 crore, growth of 18%, while reporting PBIT of Rs 47.56 crore as against Rs. 30 core of previous year FY14. Quartz segment reported a strong performance with revenue growth of 120% for the year following revenue and PBIT of Rs. 135.73 crore and Rs. 31.63 crore. Performance of Apparels Division continued to remain soft, having generated revenues of Rs. 7 crore during the year as against Rs. 14 crore during FY14. Granites – India is home to some of the best quality dimensional stones available across the globe. Endowed with vast reserves and diversities of almost every conceivable natural stone namely granite, marble, sandstone, limestone, quartz etc., the country is the third largest natural stone manufacturer in the world. Of the 300 varieties of granite present in the world market, India supplies about 200, reflecting the availability of wide array of color, texture and structure in the country. India produces more than 27 percent of the overall stone production in the world and exports over 11 percent of the world’s stone exports. As per Ministry of Mines report (January 2015), the country has an estimated 46,230 million cu. m of granite resources. The deposits of natural stones are situated across the length and breadth of the country with maximum concentration in states such as Tamil Nadu, Andhra Pradesh, Telangana, Karnataka, Rajasthan and Odisha. In terms of exports, the country shipped granite blocks worth Rs. 12, 047 crore in 2013-14 as against Rs. 9,766 crore in the previous year a growth of 23 percent over its previous year. The growth was primarily value led as volumes remained more or less stable during the period. Granite and products, exported mainly as either raw blocks or after cutting and polishing constituted majority of the exports revenue, followed by other stones and products, marbles and slate stone. While Granite was exported to China and European countries, finished marbles was mainly shipped to Japan. Demand for the product continues to remain strong aided equally by improving domestic and commercial constructions. While, the primary demand for granite is for flooring and kitchen countertops, it is also used for gravestone segment which has a large export market. Despite impressive growth, presence of inadequate infrastructure facilities, inconsistent and contradictory leasing policies and dearth of export oriented policies are curbing the growth of the segment. The Federation of Indian Granite and Stone Industry (FIGSI) is urging the government to bring granite under “major” mineral category as it will help lower the royalty outgo on mining and enhance the segment’s competitiveness. The quarrying industry is expected to grow rapidly following the acceptance of proposal as the same will ensure rationalization and result in uniform implementation of granite policies. Home owner’s preference for granite stems from its attractive and durability feature making it one of the favored surfaces to be used in flooring and countertops. Of all the tile types, Natural stone / granite is projected to grow most rapidly through 2017 through US overtaking porcelain, expected to be the second largest type in area demand terms by 2017. US demand for decorative tile is forecast to rise 6.7 percent per year through 2017, reaching 3.2 billion square feet. Gains can be attributed to the country’s improving housing and commercial construction spending. The new housing market is expected to show robust demand as housing completions grow from their low 2012 base. Tile demand in non-residential building construction applications will be spurred by strong growth in office and commercial construction spending and increasing use of tile as a low-cost, low-maintenance flooring alternative to carpets and rugs. Quartz (Engineered Stone) – Quartz is the most commonly found material on the surface of the earth. Besides hardness, it also possesses superior abrasive properties and is highly chemical resistant. Engineered quartz surfaces, comprising of 93 percent quartz particles and 7 percent binding resins and additives are recognized for their durability, strength, stain and heat resistance qualities. Such attributes make it near maintenance free product thus helping it score over other surfaces namely granite, which can more easily be stained or scratched. Quartz is also a nonporous material, which restricts the growth of mold, mildew, or bacteria. It is on account of such factors that Consumer Reports Magazine has rated quartz as the top performer amongst countertop materials such as granite, ceramic tile, stainless steel, laminate, marble, limestone, and concrete when it came to resisting prime kitchen hazards such as stains, heat and scratches. In addition to its superior exterior qualities, the initial malleable property of quartz enables flexibility and innovation in design, style, textures and production process as well as ease of fabrication. While the usages of natural stones like granite, marble, soapstone for countertops were dominant in the past, there has been a visible shift in favor of quartz over the past decade. The migration has resulted in the product becoming the fastest growing material to be used in the countertop industry, gradually eating into the share of other materials, such as granite, manufactured solid surfaces and laminate. Between 1999 and 2014, global engineered quartz sales to end-consumers grew at a compound annual growth rate of 15.7% compared to a 4.4% compound annual growth rate in total global countertop sales to end-consumers during the same period. The trend is expected to remain strong in the future, given the greater awareness and acceptance level of the product across its key markets. While the product has attained different life cycle stage across these markets the common theme of rising usage and acceptability is clearly visible across these regions. While Australia, Europe, Israel are matured market for engineered stone the product is still at a nascent stage in America and Canada region. The rise of the quartz is partially also attributable to its wider applicability varying from kitchen countertops, bathroom countertops, bar, floor and exterior walls and so on. From single digit share in USA to more than eighty percent usage in market like Israel, quartz is developing as a preferred choice for customers and developers. Granite and other solid surfaces continue to dominate the US countertops market presently, with even laminate scoring over quartz. Despite, increasing usage, Quartz accounts for just 8% of all countertops in America, resulting in one of the least penetrated developed markets in the world. The market share is very low when compared with Australia and Europe wherein the share of the product ranges from 30% to 50%. However, the awareness for quartz’s fine points -- its beauty and durability is driving the demand for the product in US and Canada, regions that materially lag the penetration of other countries and the marginal improvement and acceptability of the product within these regions will have a disproportionate impact on the category’s growth trajectory. The global demand for floor covering is expected to rise 4.5 percent annually to 19.4 billion square meters, reaching a level of $325 billion through 2018. The improved demand is expected to be fueled by the revival in the housing construction segment in developed countries in conjunction with sustained growth in building construction activity in the emerging economies. Sustained growth in construction coupled with rising per capita income in the developing world permits households to expend major proportion of expensive floor coverings. In addition, rising motor vehicle production across multiple regions is expected to further harden the demand for floor coverings. Through 2018, demand for floor coverings is expected to be fastest in North American region, buoyed mainly by the recovery in the US housing sector, with region wide demand for floor coverings in residential buildings forecast to rise 6.2 percent per year through 2018. The Asia / Pacific region is projected to pose the second fastest gains in floor covering demand, with China alone accounting for 36 percent of the incremental demand generated during the period. The strong growth forecasted for Chinese market is expected to further cement their place as the largest national floor covering market. Growth in other developed countries such as Western Europe, Australia and Japan is expected to fall short in comparison to those expected to be seen in North America or emerging economies. However, the renewal in new housing construction in Australia and Japan both, along with improvement in other Western European countries is expected to result in firming up the demand for floor covering in comparison to the one witnessed during recent years. The consumption pattern across flooring industry comprising of materials such as ceramic, laminate, wood, carpeting and natural stone varies greatly across geographies. For instance, Ceramic tile constituted approximately fifty percent of flooring covering demand in the Asia / Pacific region and Central and South America, while carpets and rugs were predominant in North America during 2013. The same period also witnessed, maximum usage of resilient flooring in Eastern Europe, where it accounted for just over one-third of regional floor covering demand. Non-resilient flooring products, which represented nearly three-fifths of floor covering demand worldwide during 2013, are expected to post the fastest growth demand through 2018. Manufacturers of non-resilient flooring are expected to benefit from rapid growth demand in Asia, wherein the same account for vast majority of floor covering sales. Demand for carpets and rugs will enjoy its fastest growth in North America due to these products extensive use in the residential market in the US. Based on average installed price, (including installation and other related costs), the global countertop industry generated approximately $81 billion in sales to end consumers in 2014. Amongst the surfaces, Granite with a share of 27 percent continued to remain the preferred material for countertops, to be followed by 25 percent share of solid surfaces in 2014. Quartz with a meagre 10 percent share remains near the infancy stage of a long term penetration opportunity. Region wise Europe, Asia Paci! c and North America with demand in excess of 20 percent continued to remain the top three markets for the products. Demand in North American market remained strong following the improved labor and housing market in the region. Improving new and existing home sales coupled with consistent repair and remodeling spending helped maintained the growth momentum. Global demand for countertops is projected to grow at 4.3 percent annually through 2018 to 505 million square meters (Source: Freedonia), with building activity, building size and economic wealth being the key pointers of countertops usage. Improved building construction activity, primarily in the developed economies which continues to recover from the worldwide recession and the subsequent gradual recovery through 2013 coupled with the developing economies efforts towards expanding and modernizing its building stock given their sustained population growth will principally drive the demand for the segment. Usage of countertops in kitchens, bathrooms, and other areas is more predominant in developed markets like North America, Western Europe, Japan and other developed markets as compared to emerging countries. Gains in North America which was the second largest regional market for countertops in 2013 are expected to sustain given the continued recovery in US building construction and, in particular, growth in single-family housing completions, which will further benefit from ongoing consumer preference for spacious kitchens and multiple bathrooms that require more countertop area. Western Europe is expected to witness similar growth through 2018 given the pick-up in construction of new houses in many countries across the region, further boosting the demand for countertops. The Asia/ Pacific region was the largest market for countertops in 2013, with nearly half of the global total. The region, generally an immature market with free-standing furniture, pedestal sinks, and other low-cost alternatives being more common than conventional countertops is expected to achieve the fastest gains in countertop through 2018. Within the region, China owing to its rising standards of living and continual projects towards modernizing their housing and nonresidential building stock is expected to drive the growth in the area. India the region’s second largest market in 2013 will continue to see gains stemming from its present lower level of countertop penetration, coupled with the improving per capita income level and enhanced distribution network given its economic progress. The type of materials used in countertops varies depending on factors such as the relative wealth of consumers and their style preferences, and the availability of local materials. Laminate and natural stone are the dominant materials used for countertops at present. Almost 33 percent of all laminate countertops were sold in North America, wherein usage of the material is predominant given their low cost. However, Laminate is expected to lose its market share globally to natural and engineered stone. Engineered stone countertops are projected to record the fastest growth reflecting lower penetration rates in many markets. Pokarna’s 100% subsidiary, Pokarna Engineering Stone (PESL) has received Kosher certification from OU (Orthodox Union) - New York for its Quartz Surfaces brand Quantra under Pareve designation. It is also acceptable to be used on Passover without special certification as it contains no raw materials that would affect food prepared on it during Passover. This certification confirms that the product adheres to the highest quality of Kashrut supervision and allows the Kosher consumers to use Quantra in their Kitchens. This certification besides enabling company to expand its market presence will also help company to meet the growing demand for products conforming with Kashrus (Kosher Concept) principles. It will help company to strengthen the trust for its products in the Jewish Market. Pokarna has inked a pact with Dutch firm Dekker Zevenhuizen B.V to broaden its consumer base in the Benelux market. Under the co-operation agreement, Dekker Zevenhuizen B.V (leading producer of kitchen worktops and accessories in Netherlands) will exclusively distribute Pokarna Engineered Stone's Ltd (100% subsidiary of Pokarna) quartz surfaces in the Benelux (Belgium, the Netherlands and Luxembourg) market. The products will be co-branded as 'EQ by Quantra'. The alliance is expected to help company to strengthen and widen its connect with the Benelux region. Pokarna Engineered Stone Limited (PESL) products have received GREENGUARD and GREENGUARD Gold certification from UL Environment, a division of UL (Underwriters Laboratories), the global safety science leader. GREENGUARD certification demonstrates that PESL products meet stringent standards for low chemical emissions into the indoor environment and GREENGUARD GOLD certification reflects that PESL Products are acceptable for use in sensitive environments such as schools and health care facilities. Before being awarded these certifications, PESL products were tested to meet UL rigorous emissions standards, screening for more than 10,000 chemicals and limiting more than 360 volatile organic compounds, also known as VOCs, which pollute indoor air and can contribute to health issues. Products carrying GREENGUARD certification can also contributes to LEED (Leadership in Energy and Environmental Design system developed by the U.S. Green Building Council) points attainment. PESL is the first Indian Quartz surfaces manufacturer to have GREENGUARD and GREENGUARD GOLD certification. PESL is already an NSF and ISO 9001 certified Company and these latest certifications further reflects the Company stringent commitment to the environment. Important certification like Kosher, Greenguard & Greenguard Gold, NSF, ISO 9001 certifications give an edge to the company as it exports its products to quality and safety conscious US and European markets. Net profit of Pokarna reported to Rs 11.79 crore in the quarter ended June 2015 as against net loss of Rs 0.99 crore during the previous quarter ended June 2014. Sales rose 55.96% to Rs 96.35 crore in the quarter ended June 2015 as against Rs 61.78 crore during the previous quarter ended June 2014. 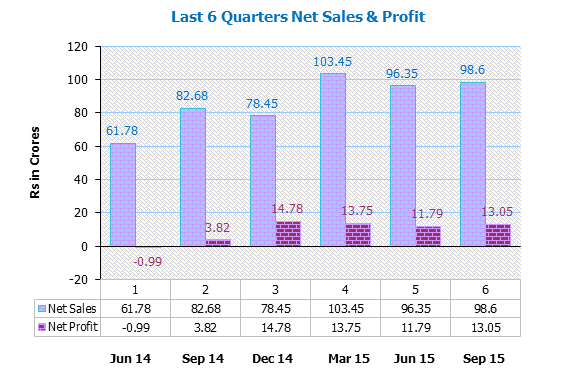 In FY 14-15, the Granite Division garnered revenues worth Rs. 183 crore as against Rs. 155 crore, growth of 18%, while reporting PBIT of Rs 47.56 crore as against Rs. 30 core of previous year FY14. Performance of Apparels Division continued to remain soft, generated revenues of Rs. 7 crore during the year as against Rs. 14 crore during FY14. Quartz segment reported a strong performance with revenue growth of 120% for the year following revenue and PBIT of Rs. 135.73 crore and Rs. 31.63 crore. We expect Quartz segment will continue to drive revenue growth and profit margins going forward. i) Despite being present in multiple markets, the Company derives major proportion of its revenues from USA. Any shift in the consumption pattern on account of political or economic event in that market could have a material impact on company’s business as well. ii) Heightened volatility in currency exchange rate following changing economic environment can have a bearing on the Company’s financial condition. iii) Company along with its subsidiary has a sizeable proportion of loans outstanding and as such any failure in cash flow generation following business slowdown could impair the Company’s ability in its debt obligation on time. i) Total global countertop market is valued at USD 74bn with Quartz at USD 6bn. USA and Canada account for 24% of the global countertop market. Demand wise Europe, Asia Pacific and North America continued to remain the fastest growing regions with growth rate in excess of 20%. Quartz Surfaces the fastest growing category with a market share of 10% remains near the infancy stage and gaining popularity amongst industry users and customers. Quartz’s share in the US and Canadian counter top market is estimated at mere 6% and 12%, respectively. As per report by Freedonia (market research firm), natural stone and engineered stone / Quartz will be among the fastest growing countertop materials, hence an excellent long term growth opportunity for the Company like Pokarna. ii) The earnings visibility for the Granite segment remains strong given the steadily rising demand for the products in domestic and international market. Backed by captive quarries, latest machinery, renewed thrust on marketing, company is well positioned to capture the opportunities. Further, company is also taking measures towards increasing the dependency on procuring raw materials from captive quarries, and as such has made several applications for grant for new mining lease(s) in different states. iii) Company’s product Quantra has received Kosher certification from OU (Orthodox Union) - New York under Pareve designation. Certification confirms product adherence to the highest quality of Kashrut supervision and allows the Kosher consumers to use Quantra in their Kitchens. Moreover, the Subsidiary Company’s products also received GREENGUARD and GREENGUARD Gold certification from UL Environment, a division of UL (Underwriters Laboratories), the global safety science leader. Following which, PESL became the first Indian Quartz surfaces manufacturer to have been awarded such certification. iv) Pokarna’s subsidiary PESL also entered into a strategic alliance with Dekker Zevenhuizen B.V, wherein the latter will exclusively distribute PESL’s quartz surfaces in Benelux (Belgium, the Netherlands and Luxembourg) Market. The products will be co-branded as “EQ by Quantra” under the agreement. The alliance will result in further strengthening and widening of the Company’s reach in Benelux region. v) Pokarna uses best in class Breton Stone Technology for manufacturing quartz slabs and tiles. BRETONSTONE® SYSTEM is the patented technology of Breton s.p.a, Italy and Pokarna has the exclusive right to make use of this technology in manufacturing quartz surfaces in India. Breton Stone technology manufactures superior quality of Quartz products. Globally, only 10-12 sizeable manufacturers produce quartz using the Breton Stone technology. Pokarna’s exclusive technology contract with Breton Stone for India gives it an edge over other quartz slab producers in India. vi) Quartz is growing faster than Counter top market, since 1999 to 2014 quartz segment grew at CAGR of 15.8% while counter top grew at CAGR of 4.4%. Company is gradually shifting its product mix towards high margin Quartz segment from traditional Granite segment. In first half of FY 15-16, Quartz reported 38% EBITDA margin with 48% contribution to total revenues. Quartz is expected to be the key growth driver going ahead for Pokarna. vii) Pokarna has recently upgraded its Quartz surfaces manufacturing facility, by which it is capable to manufacture Jumbo Slabs. Jumbo Slabs measure 131" X 65", in comparison to traditional slabs, which are 120" X55". Demand for Jumbo Slabs is growing in the US market as this size improves yield, facilitates color-matching and minimizes seams. Offering value added products will augur well for the company in terms of revenue growth and profit margins. viii) Company’s EBITDA and PAT margins are expected to further improve going forward considering robust revenue growth in high margins Quartz segment. ix) As company spent 200 crores on engineered stone production facility in 2009-10 and funded the same largely through debt and FCCBs. Capex of 200 crores resulted in almost 18-20 crore additional annual interest burden and 12-14 crore increase in depreciation. However, the capacity utilization of the plant increased only gradually over last 5 years. Company has already redeemed the entire outstanding FCCB with face value of USD 12 million and the net debt has also reduced significantly with increase in revenue growth. As company capacity utilization in Quartz segment is still below 50%, we do not see any major capex requirement for next 2 to 3 years. x) As company turns profitable, management has rewarded shareholders by started paying dividend from last 2 years. However, dividend payout is low considering debt on books and working capital requirement by the company. For FY 14-15, the company has paid dividend of Rs. 3 per share. At current share price of Rs. 1086.25, dividend yield is at 0.28%. xi) Promoter’s shareholding since last 3 years is stable at 56.67% (as on Sept’15) without pledging any shares. FII shareholding in the company is 1.23% and DII shareholding is nil. xii) Company’s topline continued to grow with steady growth in granites sales and very strong growth in Quartz surface sales which resulted in expansion of gross margins. On the back of improvement in gross margins and economies of scale, the EBITDA margins kept on improving from 10-12% to 20% in FY 14 and 25.6% in FY 15.
xiii) As per our estimates on consolidated basis, Pokarna Ltd can deliver PAT of ~60 crores for full financial year 2016, annualized EPS of Rs. 97.8 with forward P/E ratio of 11.1X for FY16. Valuation looks reasonable considering strong revenue growth and earning visibility of the company during next 2 years. xiv) On equity of Rs. 6.2 crore, the estimated annualized EPS for FY 15-16 works out to Rs. 97.8 and the Book Value per share is Rs. 125.61. At current market price of Rs. 1086.25, stock price to book value is 8.65. Considering company’s gradual shift in product mix towards high margin Quartz segment from Granite segment, use of best in class BretonStone technology to manufacture superior quality of Quartz products and immense growth potential in global countertop market, Saral Gyan team recommends “Buy” on Pokarna Ltd at current market price of Rs. 1086.25 for target of Rs. 1975 over a period of 12 to 24 months.